• Golf cart sign on drink cart for tournament. Title Sponsors recognition on all promotional materials, banner, website and custom day of event card on all golf carts and score card. Ability to welcome participating golfers and hand out company-related brochures or giveaways. Speaking opportunity to promote your company at the awards ceremony. Two professionally constructed hole signs with your company name. Two foursomes to the event. Company promotional items in goody bags to participating golfers. Social media promotion of company. • One professionally constructed hole sign with your company name. Recognition on all promotional materials, custom day of event card on all golf carts. 1 professionally constructed hole sign with your name or logo at the hole of your choice. 2 Foursomes to the event. Option of providing promotional items in goody bags to participating golfers. • One 6ft. table with table top display. May display marketing & promotional materials as well as provide giveaways to golfers. All giveaways must be pre-approved prior to tournament. Vendor is responsible for providing 6ft. table, table top display and materials. Selling of products is not permitted. 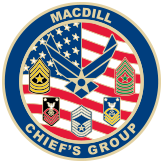 MacDill Chief’s Group (Federal Tax ID# ) is a civilian 501 (c ) (3) tax-exempt, non-profit organization. Donors may deduct contributions as provided in IRC 107 (c ) 3 of the U.S. Tax Code.